Our client was driving home after spending time with his girlfriend in San Pedro. It was after midnight. While there, he had drunk alcohol, but felt fine to drive back to Gardena. After all, he had spread out his drinks over many hours and had eaten dinner as well. In a Nutshell: Torrance arrest off 110 freeway client's car breaks down, client has 0.12% BAC, dry reckless. 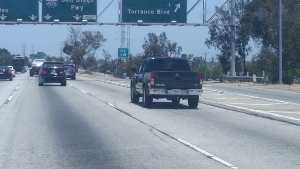 As he was heading north on the I-110 Harbor Freeway, his car began to have mechanical problems, so he pulled off at the Torrance Boulevard exit. He parked his car along Figueroa and his car “died.” He then began calling friends and AAA to have his car towed. Our client lost track of time and fell asleep. After some period of time, a CHP officer arrived to do a “welfare safety check” as he could tell our client was in his car and in an area without any homes or businesses nearby. The CHP officer claimed in his report that he “upon contacting the suspect, I immediately detected the strong odor of alcohol,” as is written in so many reports. The CHP officer, in his zeal to arrest, quickly arrested our client and had him submit to a preliminary alcohol screening (PAS) test of his breath blood alcohol content (BAC). He did this on the side of Figueroa. Our client’s BAC was measured at 0.12%. The CHP officer, however, never saw our client driving. He also never asked our client when he last drove. Nevertheless, our client was arrested for DUI (Vehicle Code §§ 23152(a) and 23152(b)). He was eventually released after signing a promise to appear in the Compton Superior Court about six weeks later. The client then contacted Greg Hill & Associates and described to Greg what had happened. Greg explained how he thought the case would be handled at the Compton Courthouse. When Greg Hill of our office appeared for the client’s arraignment, he saw the CHP report state the above events. Greg explained to the District Attorney that there was zero evidence to support the 23152(a) charge, as no one saw our client driving in a manner than demonstrated substantial impairment of his ability to safely drive a vehicle. Greg further explained that the 23152(b) charge for driving a motor vehicle with a BAC of 0.08% or higher by weight was also meritless because the reading must be within three hours of driving. Here, the CHP officer never established when our client was last driving his car. After all, although unlikely, he could have been stranded on the side of the road for over three hours. The police report, for example, did not say the client’s hood was warm to the touch, suggesting the car had been driven only minutes earlier. While it took three appearances in the Compton court to get the DA handing our client’s case to acknowledge the weakness in the report, Greg eventually prevailed on the DA. The DA offered our client a “dry reckless,” which carried with it an 18-month period of summary probation and a $150 fine only. The DA acknowledged that taking this case to a jury trial would be setting himself up for a defense verdict on the DUI charges. With a dry reckless, a violation of Vehicle Code § 23103, there were no alcohol awareness classes, no ignition interlock device to install, no Mothers Against Drunk Driving (MADD) Victim Impact Panel (VIP) classes, no Hospital and Morgue (HAM) program and no huge fines. Most importantly, a “dry reckless” is not “priorable,” so if our client were to suffer a DUI conviction in four years, that DUI would be his first. A dry reckless does not “count” as a DUI at all. Our client was very happy. Had he not hired counsel, he most likely would not have noticed the shortcomings in the CHP report and he would have pleaded to DUI, which would have been a very costly mistake.